Get lost in a thousand great books. Fourteen years in the making and fifth in the series that has over 4.4 million copies in print, 1,000 Books to Read Before You Die is an eclectic and extraordinary book about books, as compulsively readable, entertaining, surprising, and enlightening as the 1,000-plus volumes it recommends. The author, James Mustich, has been a bookseller for decades, including two running the acclaimed independent book catalog A Common Reader, and 1,000 Books is like his personal store, where every book is excellent. Mustich’s incomparable writing - lively, informed, erudite yet with an undisguised enthusiasm - not only reveals why the particular title you’re reading about is vital but also gives you the urgent feeling that you need to drop everything, right now, and read that book. The expected pillars are here - Dante, Proust, Shakespeare, Faulkner, Woolf, Joyce, Kafka - but made completely fresh in these animated essays. And in between, the unexpected titles - from Harold and the Purple Crayon to Fun Home, Do Androids Dream of Electric Sheep? to Tell Me a Riddle - are made completely essential. Aeschylus is here, and so is Nancy Drew, Herman Melville, and Edwidge Danticat. The alphabetical listing by last name results in the joy of juxtaposition - Grimm next to Grisham, Clarice Lispector followed by Hugh Lofting - prompting a rich appreciation for the gorgeous mosaic that is our literary heritage, whether poetry, science fiction, memoir, travel writing, biography, children’s literature, the novel. Because ultimately what this book is not is a canon. It is, rather, an uncommon celebration of the best that our authors have put into words - and, as one of the entrants, the critic David Denby, put it, that “special character of solitude and rapture” that is the act of reading. 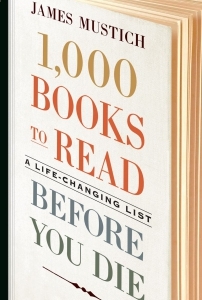 The book to raise all books-a celebration of the reading life through an unexpected and compelling compendium of a thousand great books to get lost in.